This entry was posted on February 9, 2008 at 11:42 am	and is filed under Head Tracking, Projects. You can follow any responses to this entry through the RSS 2.0 feed. You can leave a response, or trackback from your own site. Very interesting stuff there, the reverse of the Wii remote! Now we could all replicate your handy work and sit there playing games looking like Neo! Not really my handy work, I simply followed the instructions from tmiv. He gets the credits for getting this to work on PS3. hi there.. can u explain how you managed it to remove the ir filter.. i dont see any way to open thar lense contrucion without breaking it! I did not modify the webcam, I left the filter in. It would probably have worked better with the filter taken out, but it was good enough with no modifications. I saw the head tracking movie… it’s fantastic! I have a PS3 with playstation eye cam, and I want to try this experience. Where can I download the “Head-tracking on PS3” code? Is it a free code source? The source is released to licensed PS3 developers, I’m afraid it’s not publicly available. OK for the source code. But if I want only the executable file for try? Can I have this file? Sorry again, the executable is for licensed developers only as well. The PS3 doesn’t run unsigned executables. You can experiment in PS3Linux, but this particular application isn’t available in Linux. Ah OK, no problem, thanks for all. 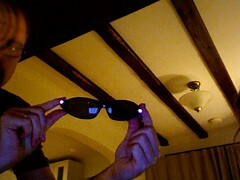 i need the ir glasses for one of my projects in head tracking….can u mail me the details of the making…or where to buy it…. The details are in the post: I took some normal glasses, salvaged a pair of IR LEDs from old remotes, stuck one on each side of the glasses. That’s all there is to it.